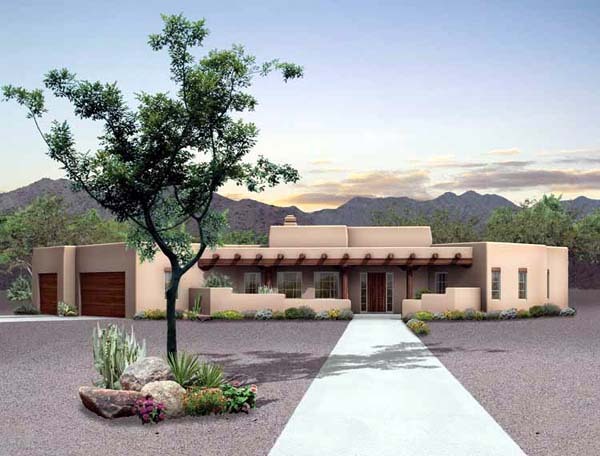 This Santa Fe-style home is as warm as a desert breeze and just as comfortable. Outside details are reminiscent of old-style adobe homes, and the interior caters to convenient living. The front covered porch leads to an open foyer. Columns define the formal dining room and the giant great room. The kitchen has an enormous pantry and a snack bar and is connected to a breakfast nook with rear-patio access. Two family bedrooms on the right side of the plan share a full bathroom that includes twin vanities. The master suite on the left side of the plan has a gigantic walk-in closet and a bath with spa tub and separate shower.